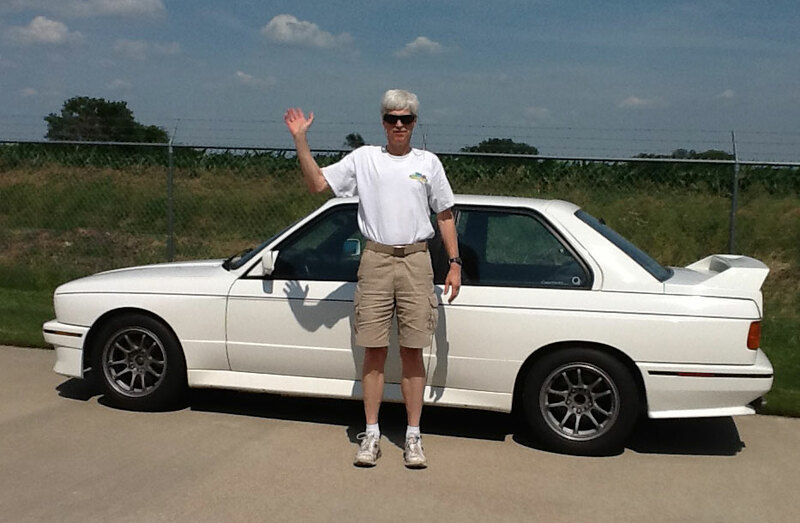 My first BMW was a 1972 Bavaria, purchased in Austin, Texas, in 1986. I had a perfectly fine and noble car (1969 Ford Country Squire “Thunderwagon”), but thought it’d be fun to have something more entertaining. I’d considered a Datsun 2000 roadster (with broken front suspension) owned by a friend of a friend in Houston. I regularly perused the want ads – 1970 Alfa GTV, anyone? An ad for a Bavaria, slightly modded (suspension stiffened, mild cam, Webers, lovely Cromodora wheels) appeared one day. I thought “too much money, too many modifications!” Then I happened to park next to it one Saturday morning in the grocery store lot. I took this as a sign. Eventually test drove the car on a highway heading east out of Austin. The speed limit dropped, so I checked the speedometer – and learned I was going 20 mph faster than I’d guessed. It felt like fine machinery – I was hooked. Mr. W was part of the family over 20 years. With both Mr. W and Junior, any time I’m driving is fun. But to pick one: My brother was kind enough to road trip with me to Detroit to pick up Junior. The first time I sat in the driver seat and started him, I thought “it sounds like a French tractor engine!” I later learned that sound is typical of the Getrag gearbox; the engine itself sings from 5000 to 7000 rpm. Despite the attractions of the engine, I most enjoy Junior’s steering, whether on the track or at street legal speeds. It’s accurate and communicative; you’d need to wrap your hands in gauze or hit them with a local anesthetic to miss the messages from the wheel. What is your favorite BMW Club event and why? I love our Longest Day Driving Schools. It’s great fun to drive Junior, but also to work with students in the classroom. I can see them learning, both in class and on the track. Helping folks learn what they can do, helping them gain skills that can save them in daily driving – that’s tremendously satisfying. It’s also a great place to catch up with folks I only see at our events. Do you have a dream car? I think the last dream car I had is one I have had since 1972 – an Austin Cooper S. I fell in love with stories of such a small car –10 feet! 1400 pounds! 1275cc! space for 4 high school boys!– doing so much. I remember Dad taking the new-to-us car through a construction zone on North Central Expressway in Dallas. The speedo cable was broken at the time; we opined that it was a little bumpy. We later calculated that 5000 rpm meant we were traversing the imperfections at 80 mph. As I noted again years later with Mr. W, a good car feels relaxed when you’re going quicker than you realize. As for a current dream car, I’m cautiously optimistic that soon someone will produce a relatively small vehicle that’s got space for 4 adults, is efficient in its use of space and natural resources, and that just feels good when you drive it. 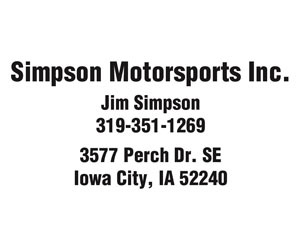 My dealer had a bright red 2008 X3 that looked so GOOD with my Iowa State Cyclone License Plates I had to buy it. My dealer always is making want to try something new- like the X1. I drove it and loved the turbo charged engine! I have not been to many events since I am in a plane for business so often but I love the dinners and lunches and the visits to the dealerships to learn about the mechanics of this fine driving machine. When I was coming on a new board, I found that another member was a guy I met at one of the BMW get together. My dream car would be one with a driver!! Car Service is awesome! German quality and performance, of course! It’s the perfect starting car for any 16-year old, and exactly what I wanted! I liked the video game event, just because I’m quite the gamer myself. It would be a 3-way tie among the early 1996 850cs, a modern M6 grand coupe and the futuristic i8. I wanted to trade in two cars (an Oldsmobile Toronado and a Nissan 300ZX) and get one car that combined the luxury and sportiness of both. That led me to my first BMW, a 2000 328Ci. I liked it so much (and the club activities & members) that I later replaced it with another new one. 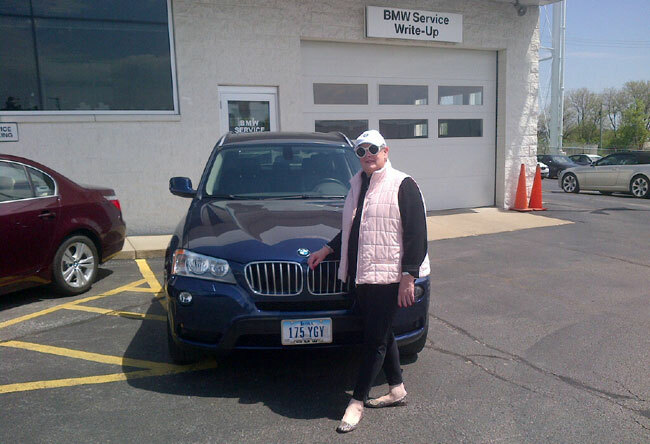 Both were purchased at Kimberly BMW in Davenport, my old home town. I had good luck with the first one, and my brother in Wisconsin liked it a lot. 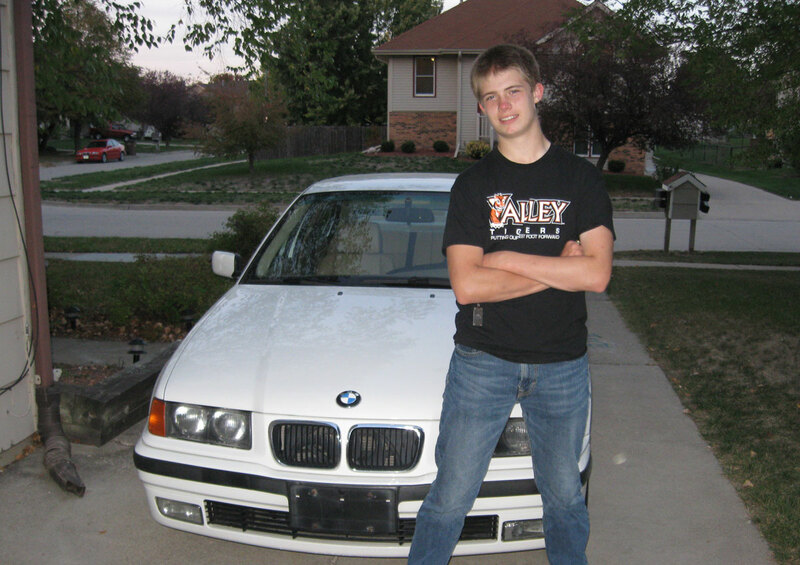 He wound up getting a 2005 325Xi. Later, I started to make plans for a European Delivery of my new one – as reported in Newswerks previously. 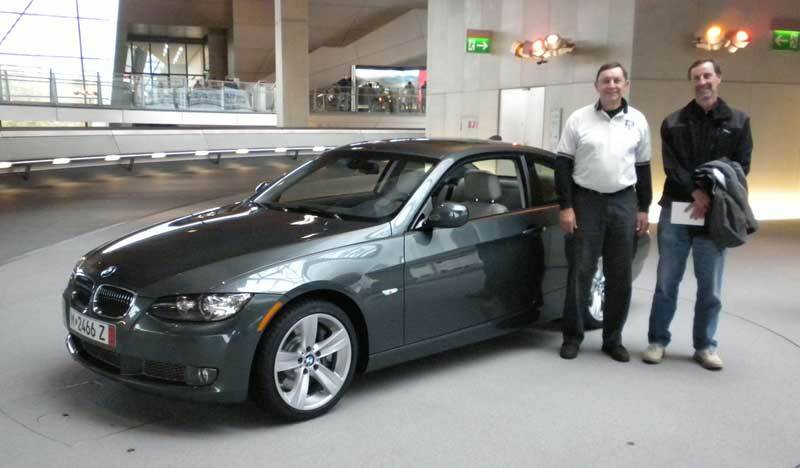 I sold the 2000 to him (for his son) and he accompanied me to Munich in October of 2009 to pick it up. We visited relatives near Frankfurt, drove the Nurburgring, and toured Berlin and Amsterdam. The car was left at the port in the Netherlands in late October. It arrived stateside around Thanksgiving. I had hoped to pick it up in Davenport before Christmas and proceed to Wisconsin, but the accessories I had purchased were not quite installed when I arrived. Kimberly lent me an X3 for the holiday, and I got it on the way back. Is all a good answer? The picnic and annual dinner are always good. I’ve been to several driving schools at MAM, a Fall Colors Tour, another cruise, one Ocktoberfest, and several tech sessions. Perhaps the most fun AND rewarding event is helping out as an in-car coach at the Street Survival schools. Those new Gran Coupe’s are awfully pretty – just like an Aston Martin Rapide, but cheaper! So is the 503 from the 1950’s. A 2002 might be fun. On the non-BMW side, give me an old Oldsmobile. How about one each from 1937, 1941, 1950, and 1955? H. S. Science teacher, retired. Driver’s education instructor. Born Des Moines, raised in West Des Moines. Reside in Clive. 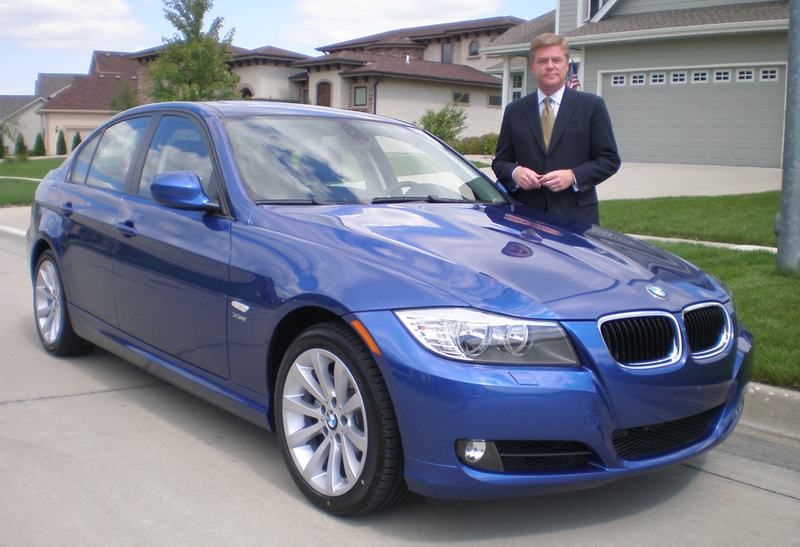 Leased one 2009 BMW. I have leased many cars in the past 20 years. BMW, Cadillac, Lexus, Acura… Currently driving a 2012 Chevy Volt. I have been a car nut since I could walk. I spent my childhood dragging my dad to dealer showrooms looking at new cars every fall and I collected all the brochures. And, I’ve always read glowing reviews of BMW. Then in 2009, the stars aligned and I found a perfect Montego Blue 328 that had my name on it! The BMW didn’t take too many trips. Mostly to work and home. For some reason it always got comments at fast food drive up windows. “nice car”…I would hear! What is your favorite car event? I’ve been a judge at the Salisbury Concours d’Elegance for the past 4 or 5 years. It has to be one of the best shows in the midwest. I am lucky enough to own my dream car. 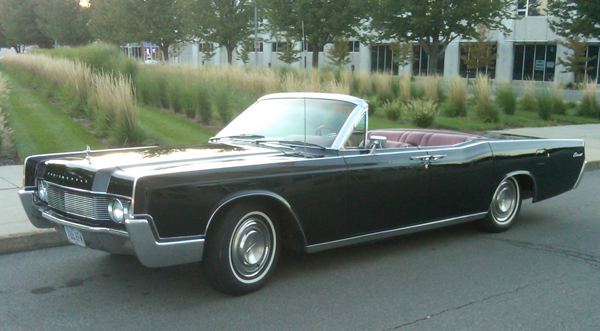 It’s a 1967 Lincoln Continental convertible. I’ve owned it for about 12 years and it has many stories to tell! I attached a picture of the Lincoln.